I'm sure you'll agree those are impressive results. But we're not online magicians or miracle workers. The reason we get results like this is simple. Most websites don't follow these 5 proven steps. We do. And that makes all the difference. Now we're going to share each of these 5 proven steps for online success with you. Proven techniques that bring you pre-sold visitors, primed and ready to buy. How top copywriters instantly capture attention, create trust, develop strong relationships and persuade visitors to click the buy button. Web design techniques that increase sales and how to avoid the popular design techniques that actually kill sales. How progressive "mini-sales" move your visitors to the final buy decision. How to write irresistible offers that no visitor can refuse. How to develop a strong email list and how to mine it for increasing sales. We're not unique. Other successful online marketers use these same steps to increase their clients' sales. And some of the leading online marketers offer this same information on the web. The lowest cost I've seen yet for this exact same information is $497. Most of the material in this e-book can also be found in popular online video classes. But you'll pay over a thousand dollars for that. And it will be worth it because this stuff really works. Now maybe you're starting to understand that this e-book is an amazing value. Unfortunately, it won't be free forever. We're going to sell it as an e-book just as soon as we add a few more examples, some screen shots, and some color charts and graphs. Then it will cost you $79. Which, I'm sure you'll agree as soon as you see it, is a fantastic bargain. Especially when you consider the same information usually cost over $1,000. 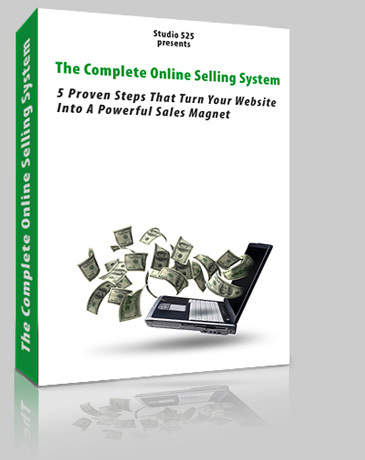 But, right now, you get this entire Complete Online Selling Sytem e-book for free. All you have to do is send us your name and email address and we'll email you full download instructions. Not only that, you'll also receive our FREE quarterly Email Newsletter Online Sales Success. Four times a year, we'll email you the latest proven techniques that are creating outstanding online sales results. The Internet changes at lightening speed. Getting the latest online sales techniques will keep your business from falling behind your competition. Like our e-book, the Quarterly Email Newsletter is free. Of course you can cancel your subscription to the Newsletter at any time. And we are stringent about protecting the privacy of our clients. We NEVER sell, rent, or give out names or email addresses to anyone. Your name and email address are safe with us. Giving away valuable free information, like our Quarterly Email Newsletter, is a key web marketing strategy. It works for us and it works for our clients. Valuable information proves that we're experts. It creates trust. It builds relationships. And, when you need to increase your online sales, you're far more likely to turn to us than an unproven unknown. We're confident you'll find our Email Newsletter a valuable resource. If you find these techniques don't increase your online sales, you can cancel at any time. Sign up for your free Quarterly Email Newsletter now and we'll immediately email you download instructions for your free (at least right now) e-book The Complete Online Selling System.